Easy enough for a beginner, this easy to make beehive-style beanie is the squishiest hat I’ve ever designed! It’s so warm and cozy, looks great and will help you become a pro at post stitches! Are you ready to make your own and get in on all the squishiness?! Here’s everything you need to know to make your own Keystone Ribbed Double Brim Beanie. There are several ways you can get your hands on the pattern. Follow the pattern for teen/women’s small size in this post, below, or download the premium version including Teen – Unisex XL sizes from the Made with a with Online Shop, Etsy Shop, or Ravelry Shop, or download the printable, ad-free lite version of the pattern (teen/women’s small size only) for just $1.99! 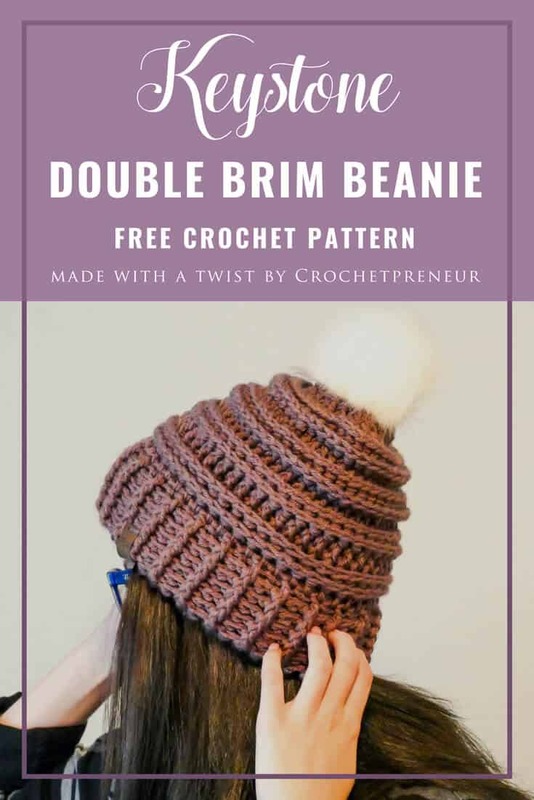 OR, if you just can’t wait for all of the hats to be released, get the entire pattern e-book, “COZE: All the Double Brims!” at a special, all-time-low rate. Grab your copy via the e-book image below! Optional: Product Tag – I get mine here. Gauge: 12 stitches X 15 rows = 4” square working in alternating DC, BPDC. RND 14: With the right side of the hat facing you, fold the bottom half of the brim into the top half so the unworked loops of the foundation row match up with the loops of row 13. RND 17: CH3, FPDC in each stitch around. Join with a SLST to top of beginning CH3. RNDS 19 – 22: repeat rounds 15 -18. RND 24: repeat round 27. RND 25: CH3, FPDC in each of the next 2 stitches, FPDC decrease across the next 2 stitches, *FPDC in each of the next 3 stitches, FPDC decrease,* repeat from * to * around. FPDC in any remaining stitches. Join with SLST to top of beginning CH3. RND 26: CH3, FPDC in the next stitch, FPDC decrease across the next 2 stitches, *FPDC in the next 2 stitches, FPDC decrease,* repeat from * to * around. FPDC in any remaining stitches. Join with a SLST to top of beginning CH3. RND 27: CH3, BPDC decrease across the next 2 stitches, *BPDC in the next stitch, BPDC across the next 2 stitches,* repeat from * to * around. BPDC in any remaining stitches. Join with a SLST to top of beginning CH3. RND 29: CH3, *BPDC decrease across the next 2 stitches,* repeat from * to * around. BPDC in any remaining stitch. RND 29: CH2, SLST in each stitch around. Finish off. Sew top closed with tail. Attach pompom and tuck in ends. I know you’re going to love making the Keystone Double Brim Hat and I so look forward to seeing your finished product. Create a project on Ravelry for your unique creation and link it to the Keystone Ribbed Double Brim Beanie. Follow me on Instagram and share your photos. Be sure to tag @thecrochetpreneur and use the hashtag #keystonebeanie and #madewithatwisters.